Customer feedback form templates are documents which have preset formats that will serve as a guide for business owners in creating their own customer feedback form. In addition, customer feedback forms are used for collecting the feedback, suggestions, and the evaluation of a business’s customer regarding the goods and services provided by the business and its staff. Why Use Customer Feedback Form Templates? Businesses use customer feedback form templates due to one main advantage: efficiency in making a form for the business. With the template, the document-maker can easily change the contents of each section with items required by the business owner. This allows the document-maker to use lesser time compared to creating a customer feedback form from scratch wherein he needs to decide on a layout and to make a draft. Customer information section: The name, address, and the contact information of the customer are some of the details to be collected in this section. In addition, the customer’s affiliated organization can also be identified along with the organization’s phone number and office address if the customer purchased the product or acquired a service on behalf of his organization or company. Product information: This section will have the descriptions of the product which was purchased by the customer and the date and time when the purchase was made. Service information: The name of the staff who catered to the customer and the type of services being requested by the customer will be enlisted in this section. Rating section: In this section, the items to be evaluated or be assessed and scored by the customer will be listed with an accompanying rating scale per item. To fill in this section of the form, the customer should mark the score that he will mark to each item based on his satisfaction when he purchased, acquired, and used the product or services of the business company. Comment section: This will be for the suggestions of the customer of how the business company can improve their products and services. Moreover, the reasons for the ratings can also be disclosed by the customer in this section. It will allow the business company to address the areas that they have to change or retain based on the customer’s overall feedback. 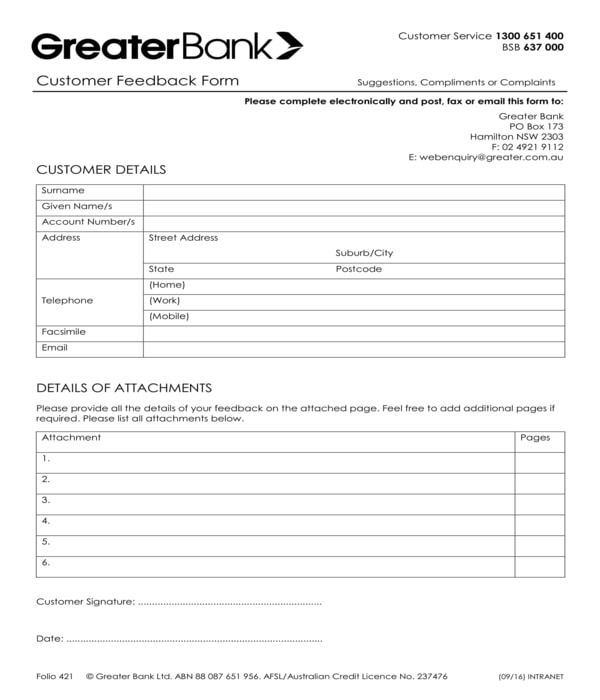 Bank Customer Feedback Form – This customer feedback form template has two pages. The first page has two sections wherein the first section documents the customer’s details such as the customer’s name, account number, address, telephone and fax numbers, and electronic mailing addresses. The second section of the first page contains a table intended for the list of attachments or the documents that the customer have attached with the feedback form for further details about his feedback and complaints. In addition, the second page is allotted for the explanations of the customer about his feedback and the indication of the feedback type that he is giving, either it’s a suggestion, a compliment, or a complaint. 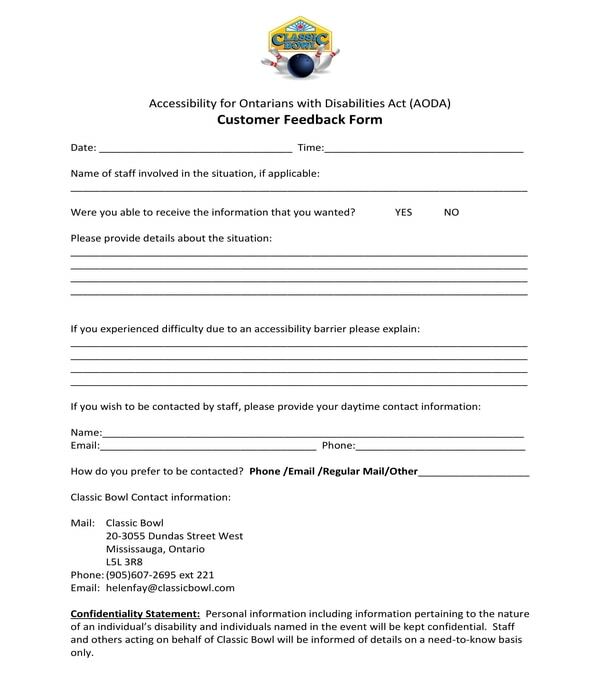 Disabled Customer Feedback Form – Business companies and stores who provide goods and services to disabled clients and customers should have a disabled customer feedback form. This form does not only focus on the feedback of the customer for the products of the company but also the special care and assistance that the company has given due to the customer’s disability. Some of the information to be stated in this form includes the date and time when the feedback was given, the name of the staff who attended the needs of the customer or the staff in question for not attending to the customer, as well as the indication of whether the customer have received his requests and inquiries or not. The details about the situation which is the subject of the feedback, the difficulties that the customer have experienced during the transaction with the company staff, and the customer’s contact information will also have to be disclosed in the form. 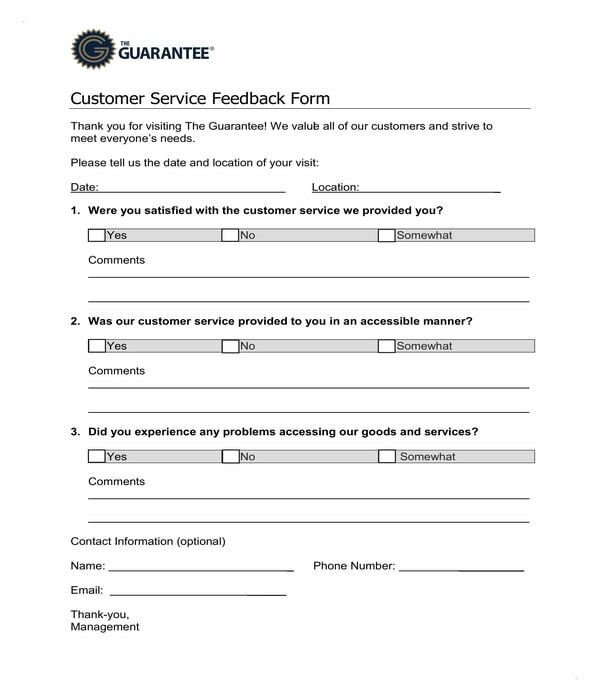 Consumer Goods Customer Feedback Form – Ensuring that customers and clients receive only the highest and the best quality goods and services are one of the goals of every company, especially those companies that focus on quality assurance and stock exchange services. 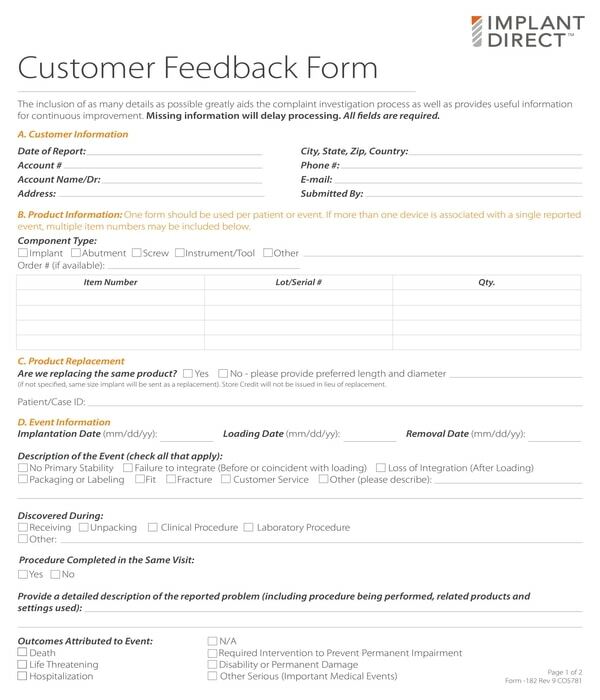 For this, a consumer goods customer feedback form is the variety to prepare and give to each customer. The form will collect the client’s feedback about the testing procedures of the company for their products as well as their inspection process, auditing, and their general customer service. The length or the number of years that the customer has been associated with the company, and the comparison of the customer towards the company and its competitors will also be indicated as part of the customer’s feedback. 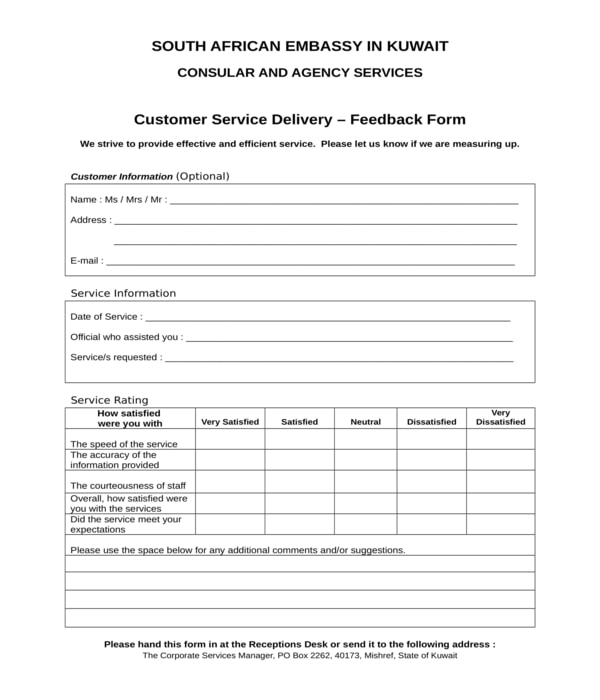 Customer Service Feedback Form – This variety of customer feedback form centers on obtaining the thoughts and the ratings that a customer gives for the company’s services. The form contains a set of questions which can be answered by the customer with a satisfaction rating along with an area for the explanations in justifying the given rating. At the last portion of the form, a contact information section is labeled as an optional area which means that it depends on the customer if he will give his name and phone number for follow-up purposes to the company or not due to privacy and confidentiality concerns. 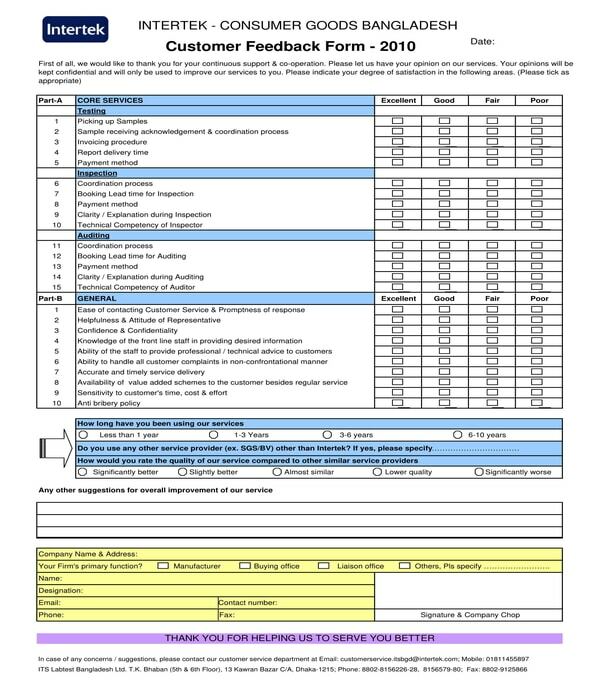 Orthopedics Customer Feedback Form – The layout of this form template is composed of boxes for the data entries of the customer. 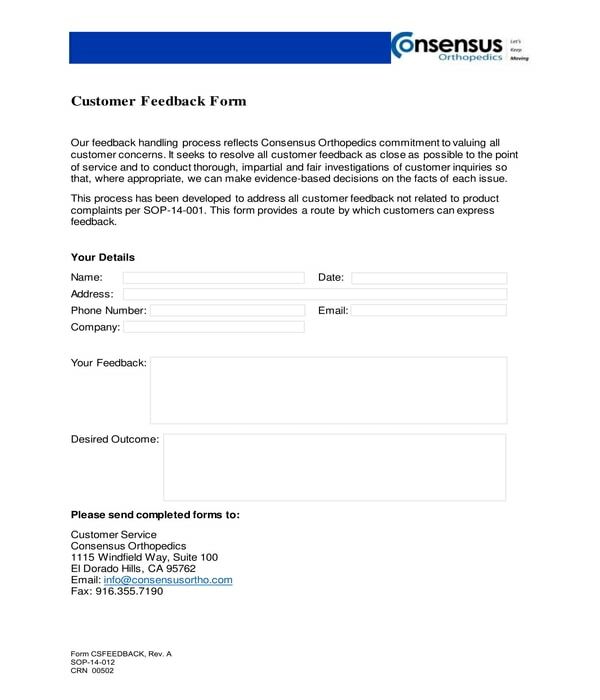 The first set of boxes in the orthopedics customer feedback form is intended to document the customer’s identity. On the other hand, the second and third boxes are for the feedback statements and the desired outcome of the customer. In conclusion, customer feedback forms are used by all types of businesses regardless of the products and services that they offer to each customer and client. Additionally, the feedback form must not be required document that customers need to fill out, rather an optional document that will allow customers to freely open up about their issues, concerns, and their thoughts about the business company.